Jang Geun Suk's fans gave a special present to the actor by donating in his name for his birthday! As he turned 30 in South Korea, a special exhibition, from which all the proceeds will go to people in difficult circumstances, opened in celebration. According to his side on August 9, the '2016 Jang Geun Suk Birthday Celebration Sharing Photo Exhibition,' sponsored by his official fan club, opened at a gallery in Cheongdam-dong on August 6 and 7. This marks the photo exhibition's fourth year, and 1,500 of his fans in Korea participated! The exhibition included pictures taken by the fans as well as fan art that went on sale. 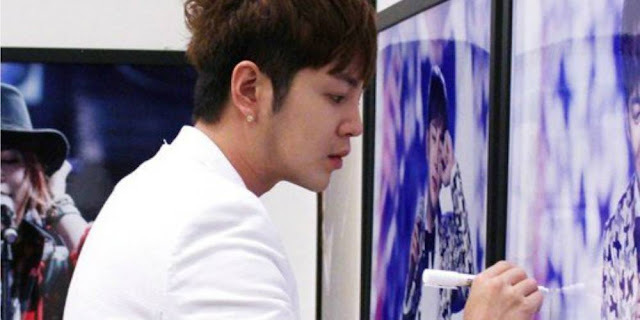 Jang Geun Suk, of course, was present at the event, checking out all the pictures and artwork by his fans as well as looking at and applauding the list of fans who participated in voluntary service. The donations made as well as the entrance fees added up to 50 million KRW (~ 45,000 USD) and will be given to people in hard circumstances.